Martin said to me “expect the unexpected” and had reservations that his new CD would not live up to the expectations of rock instrumental buffs – WRONG!! 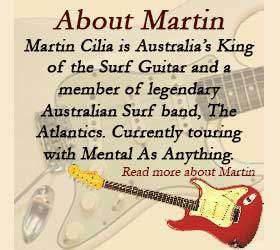 Martin travels some diverse musical roads on this album, but rest assured, he is one of the few that court the classic instro genre who has his own identifiable writing and playing style. The cover (with excellent artwork by Mandy Hall) shows a Gibson Firebird V (if my research is correct) which is a departure in itself. And the music is too. By the way, why doesn’t Martin play his signature guitar, a Martin? My score is 9 out of 10 (less one vote for including a vocal!! ), and I still don’t like those cardboard sleeves! Martin stakes his claim as a country picker to be reckoned with. A “jolly”, less than 2 minute, romp with echoes of Jimmy Bryant and Speedy West, plus a guest appearance by Jet Harris, or is it Al Caiola? This is hallmark Cilia, the easily identifiable style he has established both in solo mode and with The Atlantics. The only ‘cover’ on the album borrows much from the Beatles’ original. John Lennon’s trademark ‘Mick Green inspired’ rhythm has been replaced with some luscious acoustic guitar and while George Harrison’s phrasing remains, Martin wields a Strat and turns up the echo. .
For those of you who don’t know, Chapel Street is a Melbourne centre for nightclubs, cafes and specialist shops. This track starts with echo and space sounds, developing into a rock delight. Reminiscent of late Shads and some of Hank’s solo work. Sergio Mendes lives! Some fine nylon string playing on this Brazilian inspired Bossa. Think very early Santana with thick dark distortion. Martin stretches out and jams his way through much of this Latin inspired piece. Poignant lyrics by Dave Warner – Any muso of Baby Boomer vintage will relate only too well to the lyric. Steve Brookes sings this from the heart while the 80’s production values let us know where the journey begins. Alex Heweston (bass) and Bill Kezelos (drums) really shine on this tune. A funky Stax ‘n’ Volt vibe with 60’s Brit Blues overtones courtesy of some Freddie and Albert King inspired soloing, al la Savoy Brown and Chicken Shack. Another Tamworthy tune. A prime example of how good pickin’ and a great melody can co exist! Bakersfield meets the Blarney Stone. Very atmospheric intro giving way to a distinctive rhythmic groove that I recall Steve Stills championing. 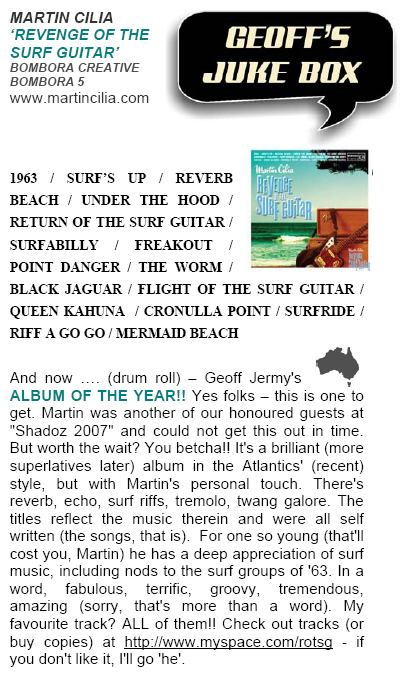 How far west of Bondi can you go whilst still retaining a surf sound? Distorted guitar intro segues into a strident 12 string propelled melody. Great!! Overdriven guitar carries the melody in the tempo of “Every Breath You Take”. Just when you think it is all over the bridge section lifts it all to another level. A crackly, dusty 78 rpm road! at that! Acoustic picking with a folk atmosphere. Ballarat is Victoria’s third largest city, about 110 km west of Melbourne. Our one criticism is that Martin’s fine acoustic playing is masked by the ‘crackle track’ which becomes a little distracting and would have been better faded out after the intro. Surely a candidate for 2 Good 4 Words album of the year. . . . . . .Any challengers?